Experience the raw beauty of the swiss alps on this fascinating tour. Starting your 6- day journey in Interlaken – a mountain village admired by many because of its alluring location between two beautiful swiss lakes, you will travel onwards by train up to the highest railway station in Europe, the Jungfraujoch. Step out of the train to be greeted by the fresh swiss mountain air, snowy peaks and a jaw-dropping view of the Aletsch glacier. Your journey continues by train as you make your way to Lucerne, where you will take a gondola to the peak of Mount Titlis. Excursion from Interlaken up to the Jungfraujoch – Top of Europe. The ­highest railway station in Europe is located 3454 m/11’333 ft. 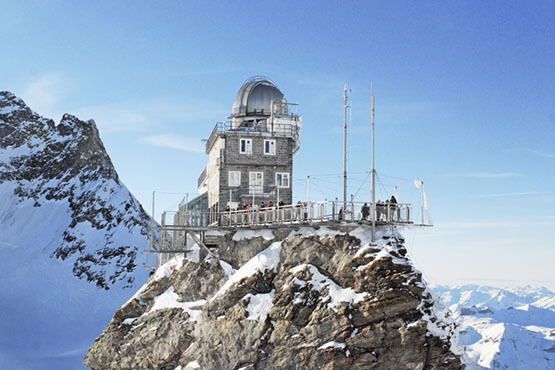 Visitors have access to a high-Alpine wonderland of ice, snow and rock, which they can admire from the viewing platforms on the Aletsch Glacier or in the Ice Palace. The railway journey to the Jungfraujoch is an experience which leads through the Eiger and the Mönch. At the Eismeer and Eigerwand intermediate stations, visitors can enjoy the beautiful view from the Eiger North Face. Overnight in Interlaken. Excursion to Mount Titlis. From Lucerne the train takes you to the mountain monestry village Engelberg where you board a gondola which takes you up to the Trübsee. You continue your trip by another gondola to Stand and finally the first revolving Titlis Rotair cablecar takes you up to Mount Titlis. Visit the glacier cave and ride the Ice Flyer chairlift. And get your thrills on the TITLIS Cliff Walk. Overnight in Lucerne. 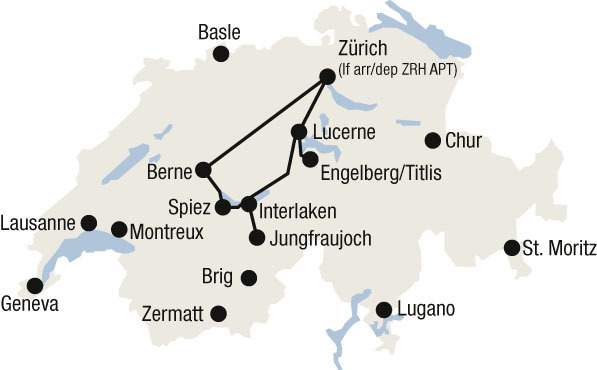 Rail journey from Lucerne to Zurich. Overnight in Zurich.